Houghton Mifflin Harcourt. Edited by Siddhartha Mukherjee.Tim Folger, Series Editor. Science is a scary word. At least, it used to be for those of us who grew up messing around in the hazy world of literature and art, not empirical facts. Science was what made it possible to go to the moon, so science meant rocket science. But it seems to me now that a fear of science is a result of a rigid (and, in my day, gender-biased) educational system, where disciplines are divvied up into discrete categories, as if one had nothing to do with the other. How wrong, and how sad. Science seeks answers to the same questions that the humanities do: Who are we? What is our purpose? Where did we come from? It is all about observation. Galileo studied the moon and determined that it was not flat, and from this went on to claim that the Earth was not the center of the universe. In the Foreword of The Best American Science and Nature Writing 2013, series editor Tim Folger points out that Galileo’s discovery was rejected in his time, not unlike climate change in ours. And so it goes. 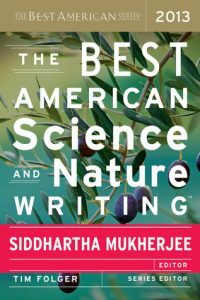 I’m glad to see Nature Writing is part of this series, and not because it makes for an easy segueway to “science,” but because we need to rethink nature altogether. We have made nature plush and Disney-like by removing most all of our predators, as J.B. MacKinnon writes in “False Idyll” (originally published in Orion). “We have rendered nature an easy god to worship,” MacKinnon says. “Nature is not a temple but a ruin.” If Man against Nature is one of the great recurring themes of literature, then we have been battling a straw dog. In “Our Place in the Universe” (Harper’s) Alan Lightman contemplates the enormity of the universe and wonders how such a remote concept can ever fit into our idea of nature. He notes that in Ralph Waldo Emerson’s essay “Nature,” Emerson separates humans from nature, and crowns nature as being morally superior. To Lightman, we are not separate so much as insignificant. The essays in this collection, each a small revelation unto itself, cover the waterfront, what is left of it. From “Which Species Will Live?” (Scientific America), Michelle Nijhuis argues that it is not enough to save specific species, but the eco-systems in which they live, or what is the point? Sylvia Earle, in “The Sweet Spot in Time” (VQR) writes about the disappearance of coral, the sad state of ocean life as a whole, and how this is the moment to take action, “the next ten years will determine the direction of the next ten thousand.” In “Recall of the Wild” (The New Yorker) Elizabeth Kolbert (whose most recent book is The Sixth Extinction), writes about the strange re-wilding programs taking place around the world. Governments in Europe are using marginal land to introduce herds of animals, like feral horses and deer, and letting them roam under the high power lines. 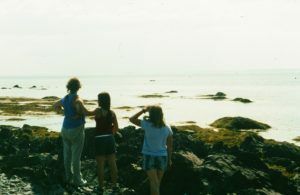 The article raises questions about the ultimate purpose or benefits of re-wilding, with the sober realization that now even wilderness is a human creation. In “Out of the Wild” (Popular Science), David Quammen writes about our most dangerous predator, and the smallest, the zoonotic viruses that are transferable from animals to humans, such as Ebola, SARS, and AIDS. Tim Zimmerman in “Talk To Me” (Outside magazine) interviews researchers who are attempting to communicate with dolphins, even though the sentiment is that we might very well have nothing to talk about. 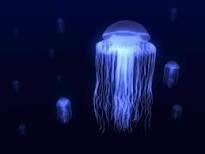 It is a sentiment that ties in to Nathaniel Rich’s “Can a Jellyfish Unlock the Secret of Immortality?” (The NYT Magazine), which looks at Turritopsis dohrnii, a jellyfish that instead of dying, returns to being a polyp to start its life cycle over. The conclusion of which is that we are perhaps intelligent enough to achieve biological immortality, but we don’t deserve it.